My dream job would be to work in the FDNY. I first started to get into the mindset of becoming a firefighter after watching the movie Backdraft on TV when I was 9. When I was in middle school, I started to watch the TV Show Resuce Me. They both had somewhat different views on the life of a firefighter and show not just the rescues and the action but was also happens behind the scenes and in everyday life. When I was in pre-K, 9/11 occured and sadly I lost my uncle that day. After that day, I felt people needed to be more united and not have negative biases against one another. I am currently 20 years old and go to John Jay College of Criminal Justice. Fire and Emergency Service is my major here. I am a transfer student and I made the right decision. Here they had the major that I wanted to follow and I don't feel lost like I did before. My hobbies consist of playing and watching basketball, playing video games, listening and going to music events. I love watching movies and analyzing the good ones and somtimes the bad ones too. Watching a great movie no matter the movie genre is great because they all have some kind of message. I love to watch movie reviews on youtube because they sometimes give a different from the one that I have. I'm a person who feels that everyone should be able to express themselves without having to hide. My message is a simple one: treat others the way you want to be treated. rld work in the privileged households of upper-middle-class and above families, single people, single mothers/fathers as well as the elderly or ill. The transnational labor market shows a new trend “as women who naturally care for the young, the old, and the sick in their own poor countries move to care for the young, the old, and the sick in rich countries, whether as maids or nannies or as daycare and nursing-home aides. Mostly migrant women, hoping to improve their families’ fates and lives, leave behind their families and children, sometimes even their babies, for years to come." Their migration this creates a further “distortion and erosion of the Third World" economies. Still, even from far away, mothers keep on caring by sending money, gifts; they listen to and talk to their kids on the phone and keep doing care work in new and old spaces in whatever ways that they can. 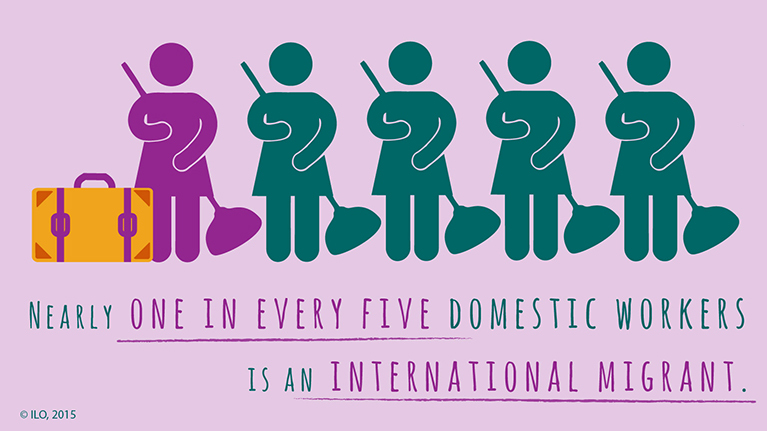 Female migrants who work in households and supervise children in affluent countries, what we have come to call nannies must in turn leave their own children in the care and protection of other women. Chains of care workers in the global South and the global North exist like a kind of transnational network that enables the daily life of privilege peoples in the Gobal North. These women were already doing care work in their home countries without any payment. Now they perform similar work in over-developed countries, for just as low of wages (although higher than those available back home). Many countires now even promote female migration by providing easier access to permits and papers for travel. The feminization of migration is a topic that affects us all today. Saskia Sassen, “The Excesses of Globalisation and the Feminisation of Survival,” Parallax 7, 1 (2001): 103. Your comment must be approved by the portfolio owner before it will show up on the site. Nobody has commented on this page yet. Be the first! For more about the gender studies archive, please see the course website at blackwomenrhetproject.com or send an email to ckynard@jjay.cuny.edu.